Oh The Spaces We Go. Citizens and family in historical spaces. This upcoming May, I will be getting married. My future in-laws, The Hicks family, are multi-generational residences of Columbus, Georgia. They are proud of their city and eager to share its history with anyone who will listen, and as a Historian I am. In our most recent visit to Columbus, the Hicks invited us to explore Columbus’ Heritage Park. The names and families that contributed to the building of Heritage Park. Heritage Park is located in Columbus’ Historic District between Front Street and Broadway. 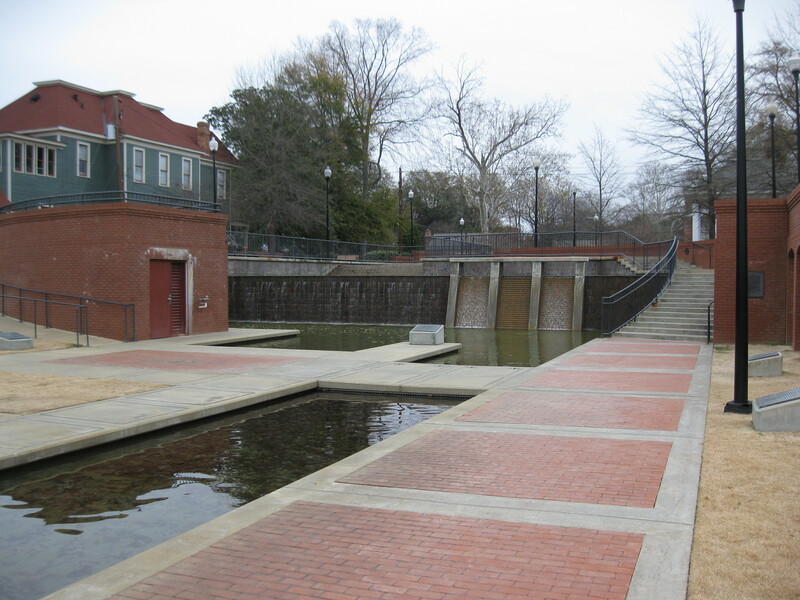 Set next to the Chattahoochee River and the Columbus Iron Works (also known as the Convention and Trade Center). The site’s location implies the importance the river and the iron foundry played in Columbus’ development from a trading town to an industrial powerhouse. The interpretation presented at Heritage Park is focused on the industrial entrepreneurs and Columbus workers from 1850 to 1910. The Hicks shared that the families of these entrepreneurs are still running these businesses or others in and around Columbus. The sculptures and structures represent the entrepreneurs of Columbus in the textile, gristmill, brick and foundry industries, as well as agriculture and forest products, dams and river trade, and Coke-Cola. Fact I did not know prior, Dr. John Pemberton, the creator of the Coke-Cola recipe, was once a pharmacist in Columbus. Looking at Heritage Park with a critical eye, the statue of Pemberton seems out of place compared to the other blue-collar representations. The interpretation provided little indication that Coke-Cola had changed or affected Columbus’ economic face or citizens’ lives. Steve shared that there is a continual debate between Atlanta and Columbus about the birthplace of Coke-Cola (of course he argues for Columbus because Coke-Cola continually funds Columbus events, buildings, and public programs). However, I understand the “claim to fame” Coke puts Columbus on the map within National history. Pemberton is the only figure represented as himself at Heritage Park. The other entrepreneurs are interpreted through depictions of their industries. A water element runs through the park from east to west representing the Chattahoochee River. On the river are representations of the Chattahoochee’s dams and the skeleton frame of a steam paddleboat. 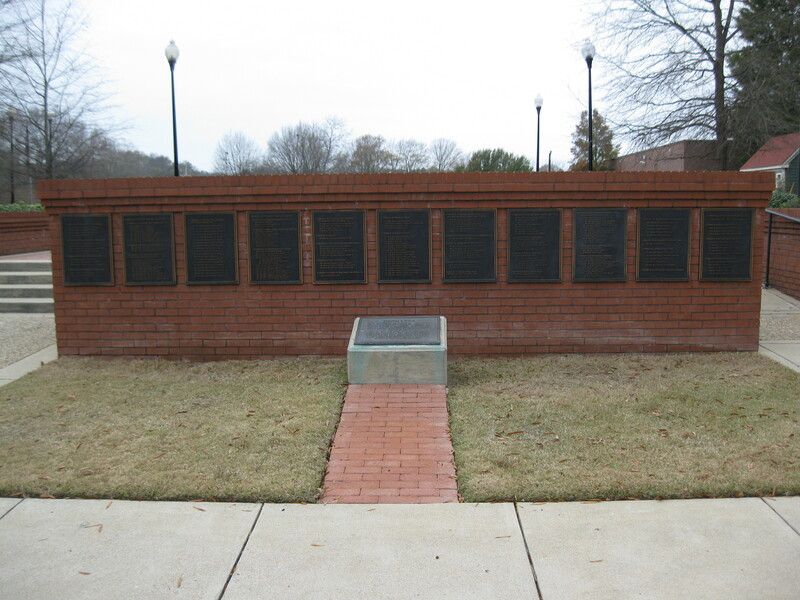 The plaques accompanying these representations speak of the men that oversaw the construction of the dams and led the trade routes on the Chattahoochee. Additionally, the plaques gave a condensed timeline of events that changed the framework of these companies. 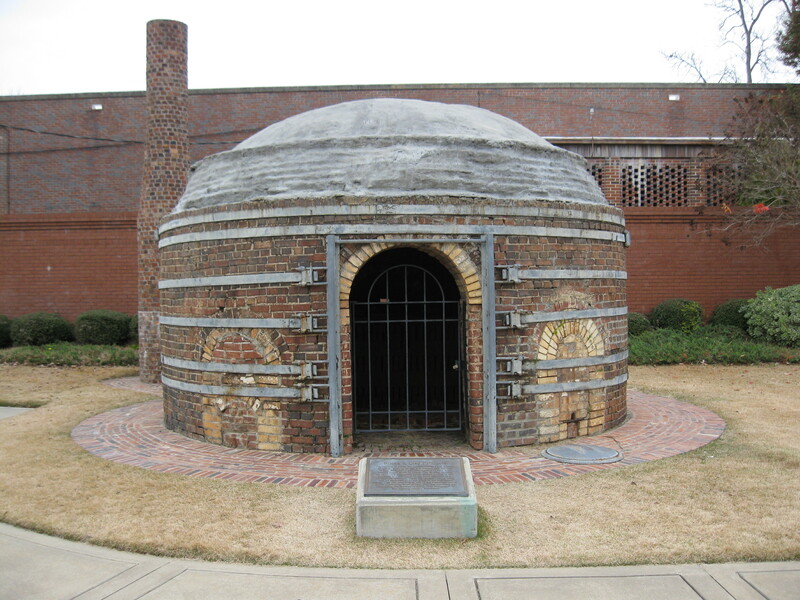 A favorite structure of mine was a reconstructed beehive brick kiln from which the famous red clay brick’s of Georgia were produced. It is the only structure that illustrates a notion of what working in these industries would involve. Other structures attempt to illustrate this notion, but don’t quite reach it. The brick kiln is seen as “this was really there, workers touched this”. 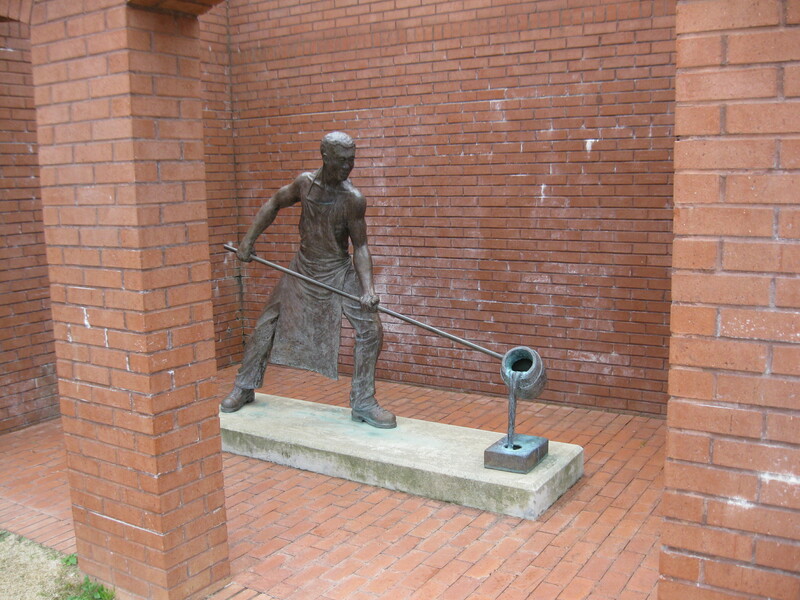 The representations used to include workers fall short of that marker because they are simple seen as statues of workers. 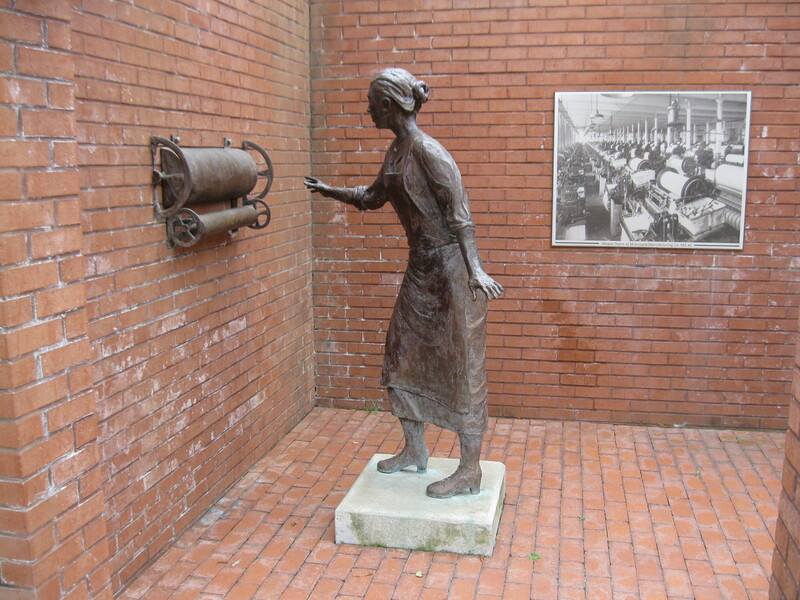 Don’t get me wrong; the statues of a textile and foundry worker are creative and thoughtful. Bricks frame the figures as if to show them in the factory at work, and behind them are photos of what the factories looked like. The figures themselves are shown in action, a woman is working at a spindle and an African American man is pouring iron. The presence of these minority figures shows a thoughtful effort by the creators of Heritage Park to be inclusive. However, once again, the plaques accompanying the statues limited the interpretation to the men that established these companies and transactions undergone as the companies grew. Maridonna and I both wished for more information of the workers and their lives. We both left Heritage Park with a desire to know more about Columbus’ workers than anything else. Especially after seeing the memorial commemorating the workers. A simple plaque stood in front of three Dogwood trees, but there was no interpretation of what the trees signified. We wanted to know, why Dogwoods, was there a significance with the number three? More important then my assessment of Heritage Park was what the Hicks shared with me at Heritage Park. They added their own stories of growing up in Columbus, how these companies affected their friends and families lives and how they still affect them, and what they felt was missing from Heritage Park. The excitement the Hicks showed sharing their history in Heritage Park reminded me of the pride my uncle emits when sharing his knowledge of Chicago’s history in the city’s streets. It is the same pride I feel when recounting Oregon history. Simply being in historical spaces creates an urge in people to have a conversation about what they remember and where they come from. am stunned why this coincidence did not came about earlier! What’s up to every one, it’s genuinely a pleasant for me to pay a visit this site, it consists of priceless Information.